Home Campaigns & Elections Election Over, America Wins! 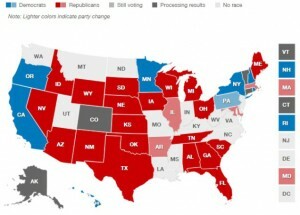 Tuesday’s election results nationally represent an unmistakable shift to the right. Voters across the country took the president at his word, that his policies were on the ballot last week, and resoundingly rejected them. GOP victories in the Senate, the House, and governorships, served as a denunciation of the policies that have made this the most moribund post-recession economic recovery in history, thwarted by onerous regulation and a steady stream of anti-private sector policies of the administration. Coming into the election, the Democrats controlled the Senate by a 53 to 45 margin, and 2 Independents who caucused with the majority party. Republicans gained seven seats, including Arkansas, Colorado, and North Carolina where Democrat incumbents were defeated, and four seats where Democrat senators retired, including Iowa, West Virginia, South Dakota and Montana. The Alaska race is still undeclared, with the Republican leading, and Louisiana is facing a runoff that will likely result in another gain for the GOP. 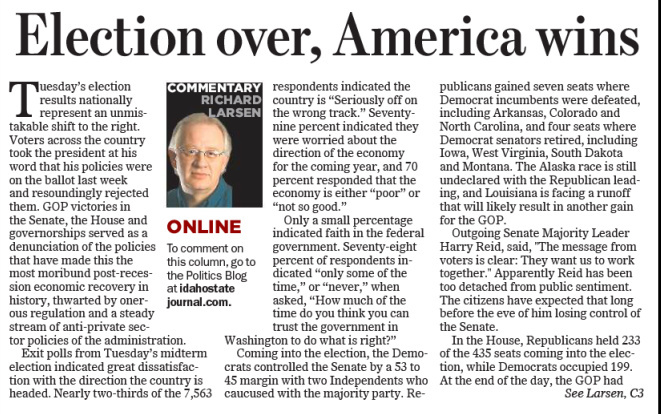 Outgoing Senate Majority Leader Harry Reid, said, ” The message from voters is clear: They want us to work together.” Apparently Reid has been too detached from public sentiment. The citizens have expected that long before the eve of him losing control of the Senate. In the House, Republicans held 233 of the 435 seats coming into the election, while Democrats occupied 199. At the end of the day, the GOP had lost two seats, but gained 15, for a net gain of 13 seats. 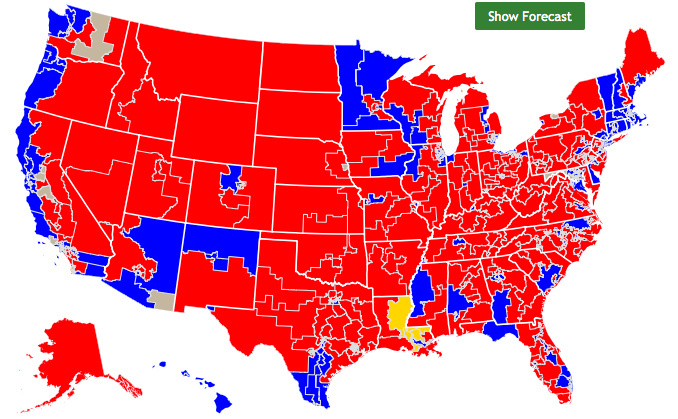 This is the largest majority the GOP has held in the House since 1930. As of this writing, eleven House seats are still undeclared, so the margin could increase even more. Governor races followed the same trend as the congressional contests. 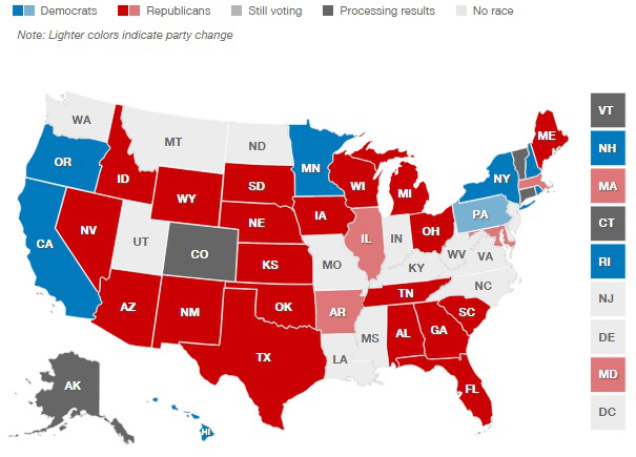 Republicans now hold 31 of the statehouses, and Democrats, 17. Two governor races are still undecided. 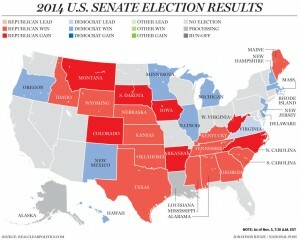 The most surprising gains occurred in deep blue states, Illinois, Massachusetts, and Maryland. The good news for defeated Governor Pat Quinn, is that he’s one of few recent Illinois governors to leave office not wearing handcuffs. The question now is what the Republicans will do with their newfound power. At the federal level, there are limitations to what Congress can accomplish, even controlling both chambers. They don’t have a veto proof majority to override presidential vetoes. And at the state levels, many of the newly elected GOP governors face legislatures controlled by the opposing party, either in one or both chambers. All around, there will be limitations to what can be accomplished. The greatest source of congressional inaction and gridlock will be displaced when Harry Reid is no longer the Majority Leader with the new Senate. There are currently nearly 300 bills collecting dust on Reid’s desk that have been passed by the House that he has refused to place on the calendar or assign to committee. 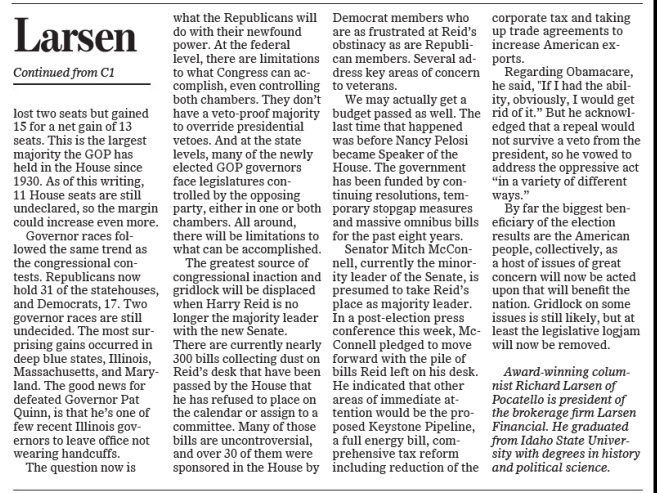 Many of those bills are uncontroversial, and over 30 of them were sponsored in the House by Democrat members who are as frustrated at Reid’s obstinacy as are Republican members. Several address key areas of concern to veterans. We may actually get a budget passed as well. The last time that happened was before Nancy Pelosi became Speaker of the House. The government has been funded by continuing resolutions, temporary stopgap measures, and massive omnibus bills for the past eight years. Senator Mitch McConnell, currently the Minority Leader of the Senate, is presumed to take Reid’s place as Majority Leader. In a post-election press conference this week, McConnell pledged to move forward with the pile of bills Reid left on his desk. He indicated other areas of immediate attention would be the proposed Keystone Pipeline, a full energy bill, comprehensive tax reform including reduction of the corporate tax, and taking up trade agreements to increase American exports. By far the biggest beneficiary of the election results are the American people, collectively, as a host of issues of great concern will now be acted upon that will benefit the nation. Gridlock on some issues is still likely, but at least the legislative logjam will now be removed.